I’m officially bearish on the stock market. 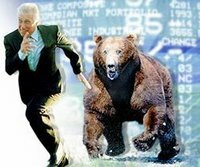 Equities plowed forward in the 2nd half of 2006 despite slowing growth, rising interest rates, inflation concerns, falling housing prices, a weakening dollar & an inverted yield curve. To me, this sounds too eerily similar to 2000. The 3rd point was the most important (and most intriguing). Every time a bearish set of economic data was released in late 2006, the stock market shrugged it off since it heightened expectations of a Fed rate cut in 2007 (which stimulates growth). On the other hand, when positive data was released, the market still rallied. Thus, the stock market was going to rally no matter what the news!!! This year should be different due to (a dirty word for investors) STAGFLATION. Yesterday’s Fed minutes indicated the presence of this double whammy: slowing growth AND rising inflation. These 2 phenomena rarely work in opposition. What this means is that the economy is slowing, but the Fed is unlikely to cut rates as long as inflation is an issue. This is very bad for the stock market and, to a lesser extent, the bond market. The inverted yield curve (where short-term rates are higher than long-term rates) is also still an issue. 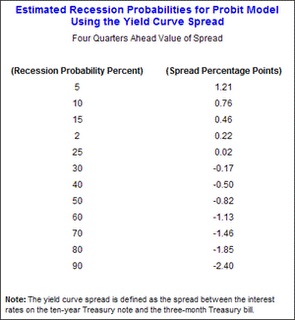 In 1996, authors Estrella and Mishkin released a famous Fed study that developed a probability table about how likely a recession would be 4 quarters later, given a particular level of the yield curve spread. Their study accurately predicted the stock market crash in 2001 when the yield curve was inverted one year earlier. The last few months, the spread between the 3-month & 10-year bonds has been -0.40% indicating a ~40% chance of a recession. Even barring a full-fledged bear market, it's notable that the Dow has now gone over 1000 trading days without even a 10% correction. The current advance is among the 3 longest uncorrected advances on record. 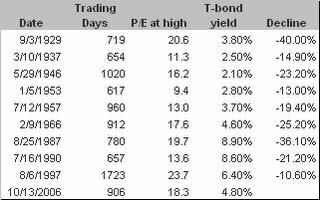 The table below indicates all prior instances where the Dow advanced more than 600 trading days without a 10% correction, along with the price/peak earnings ratio of the S&P 500 and the 10-year Treasury bond yield at the market high, and the extent of the ensuing decline. This rally cannot ignore all these deteriorating economic conditions forever! If you think the stock market will keep plugging along, you’re certainly not alone. But several of the current bearish economic indicators must disappear for this to happen. But not all the economic news has been bad either....it's a mixed bag and I get a zig zag feeling as a result. I am anxiously awaiting the growth and inflation news in Q1 2007 before making any further "calls" in this market. Thanks very much for the yield curve study reference. I'm pretty bearish myself - actually, more than just "pretty" - based on the premise that the asset/debt bubble will soon implode. I don't know when it will happen, but once it starts it will be very difficult for the Fed to stop the deflationary down cycle until more sustainable asset/debt ratios are re-established and personal savings ratios get significantly positive once again. I calculate an S&P 500 level of abt. 600-700; the whole calculation is laid out in a series of postings in my "other" blog, "Sudden Debt".